BMW Motorrad Italia Goldbet rider, Michel Fabrizio scorched to provisional pole position in the opening qualifying session at Monza. The 27 year old Italian who was second fastest in this morning Free Practice session set an impressive 1.42.327 which was 0.6s under Cal Crutchlow’s 2010 lap record but still over half a second off Max Biaggi’s 2011 best lap. Fabrizio topped both factory BMW men Marco Melandri and Leon Haslam who both showed impressive pace and consistency during the 45 minute session. Eugene Laverty improved from sixth this morning and is now on the provisional front row alongside the three BMW’s. Row two is made up of Fabrizio’s BMW Italia team-mate Aryton Badovini who made it four BMW’s in the top five. He heads in form Brit Tom Sykes, Max Biaggi with Chaz Davies impressing in eighth place. Carlos Checa moved up to ninth onboard his Althea Ducati with Jonathan Rea 11th on his Honda Superbike. 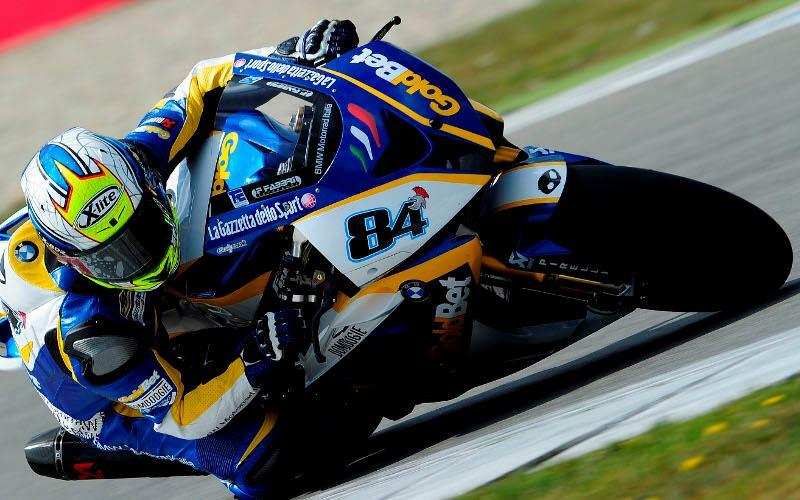 Crescent Fixi Suzuki rider Leon Camier claimed 13th, one place behind his team-mate and Monza rookie John Hopkins.